Michelle Jankovic has taken matters into her own hands. After her son Bailey, who has cerebral palsy, started school, the Berwick mum said she felt “disconnected” from disability services. 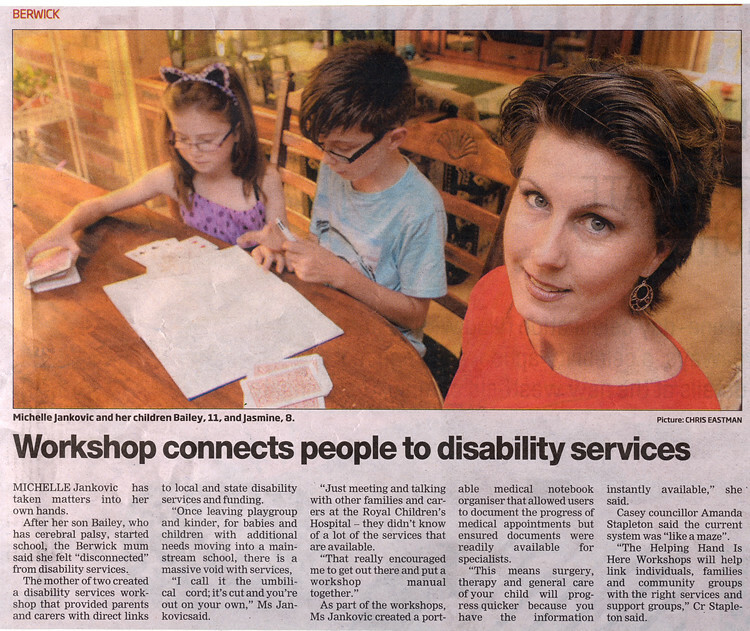 The mother of two created a disability services workshop that provided parents and carers with direct links to local and state disability services and funding. “Once leaving playgroup and kinder, for babies with additional needs moving into a mainstream school, there is a massive void with services, “I call it the umbilical cord; it’s cut and you’re out on your own,” Ms Jankovic said. “Just meeting and talking with other families and carers at the Royal Children’s Hospital – they didn’t know of a lot of the services that are available. As part of the workshops, Ms Jankovic created a portable medical notebook organiser that allowed users to document the progress of medical appointments but ensured documents were readily available for specialists. “This means surgery, therapy and general care of your child will progress quicker because you have the information instantly available,” she said. Casey councillor Amanda Stapleton said the current system was “like a maze”. The Helping Hand Is Here Workshops will help link individuals, families and community groups with the right services and support groups,” Cr Stapleton said.